Happy day, dear friends. Have you given any thought to your holiday baking? Every year, I enjoy going through my recipes and deciding which creations of goodness I will attempt. Even though it is a little early to prepare some recipes ~ it isn’t for fruitcakes. 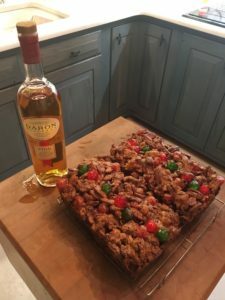 Fruitcakes are best aged a little, and especially if they are allowed to age with apple brandy. I prefer using Calvados, a French apple brandy. It only takes a wee bit, however, it truly creates magic. All this being said, today I am sharing my fruitcake recipe. It is not difficult. You need a really, really large mixing bowl, patience to prepare the pans and of course, Calvados. Note: This recipe makes one 10inch tube pan or 2, 9x5x3 loaf pan size cakes. This cake freezes extremely well. 1 lb. whole candied cherries, plus a little extra to decorate tops of cakes. Cut wax paper to fit your pans. Grease pan well and then grease wax paper, before placing in pan. In large ( really large) bowl, add dates, candied pineapple, and cherries. In another small bowl, mix flour, baking powder, and salt. Sprinkle this mixture into the bowl containing fruit. Mix fruit and dry ingredients well with hands – separating pieces so that all are coated well. In another medium bowl, beat eggs until frothy. Gradually add 1 cup sugar and beat until blended. Add egg mixture to fruit mixture. Mix well with hands. Add pecans and mix until nuts are evenly distributed and coated with batter. Pack into pans. At this point you can decorate the top of the cake with extra cherries, this is optional. Bake for about 1 and 1/2 hours. When done tops of cakes will look dry, extra baking does no harm. I usually bake them for about 2 hours, 15 min. Remove from oven and let stand about 10 minutes. Turn out onto wire racks and carefully pull off waxed paper. Drizzle with brandy – about 2 Tbls. per cake or 4 if using a tube pan. These cakes take several hours to completely cool. Once they are completely cooled, wrap in cheesecloth which has been soaked in a little brandy. Then, wrap tightly in foil and either refrigerate or store in a cool place. Note: Should you have any questions about this recipe, just send me a message under the ‘contact section’ of this blog. 10 Comments on "Fruitcake, Anyone?" Pam, I am so happy you have gotten your dear mom’s recipe down. She had undoubtedly made it so many years she didn’t need a recipe. I love it too, with a cup of coffee. It truly says, “the holidays are here.” Enjoy baking yours ~ I almost love to make them as much as I love to eat them. Happy days to you, dear friend. I used to make a white fruitcake, but then I started making this recipe with the dates and loads of pecans. Oh, Brenda – mincemeat tarts. I love mincemeat. My mom made her own with lots of apples and pears. Then she made a mincemeat cookie that was like a little pie – they were wonderful. Do save me a tart and I will bring some holiday tea. We will have a party – eating goodies and watching your birds. Enjoy these special days, dear friend. I was never a fan of fruit cake, but maybe I just haven’t had the right one. Yours does sound good. Penny, I was never a fan of fruitcake either, until I had this recipe. I don’t care for the citron or bitter fruit peels in many fruitcakes. This one has so many dates and pecans and the only fruit is the cherries and pineapple. I think you might enjoy it. Plus, it freezes extremely well – from year to year. Sandra, your fruit cakes look just beautiful! I remember my grandmother always having fruit cake on the dessert buffet on Christmas Eve. I have never tried my hand at making one. If time allows, I may try to make one and use your recipe. It sounds delicious! Thanks so much for sharing! Happy Thursday, sweet friend!! !